Front row (left to right): 1. Charles Laudeman, 2. Harold Kruz, 3. unidentified, 4. Scott Dyson, 5. Kerry Taylor, 6. William Ginn, 7. David Christensen. Second row: 1. Brenda Walling, 2. unidentified, 3. unidentified, 4. Ampero Mejia, 5. Joyce Milochik, 6. Andrea Medrono, 7. unidentified, 8. Willa Worley, 9. Kathryn Kane. Third row: 1. Larry Butterfield, 2. Roger Duke, 3. John Ronda, 4. Ronald Silcocks, 5. unidentified teacher. Note: According to the school's current website, the correct spelling is "Marylin". Credits: From the collection of Ron Silcocks. Thanks to Ron Silcocks and his sister for identifying the kids in the picture. 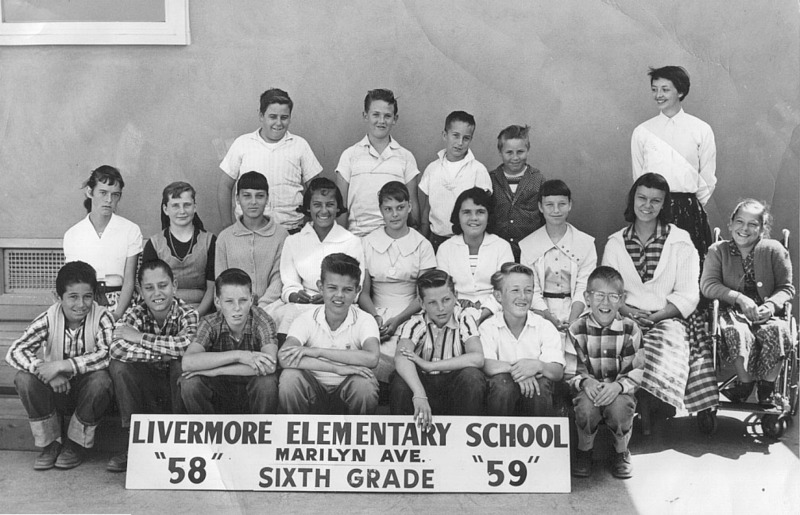 To find other pictures from Marylin Avenue School in the archive, see Livermore class pictures listed by school: Marylin Avenue School. And if you have any pictures from Marylin Avenue School that you would like to share, please submit them to the Archive.